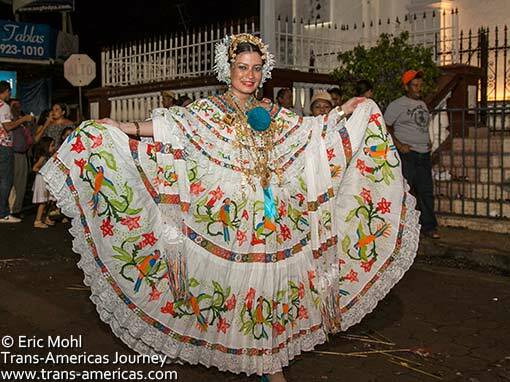 The national dress of Panama is an elaborate, spendy, oddly modest yet alluring get up called a pollera and we got an eyeful of polleras on parade during the final day of Carnival (aka Carnaval) celebrations in the towns of La Villa de Los Santos, Santo Domingo, and Las Tablas. 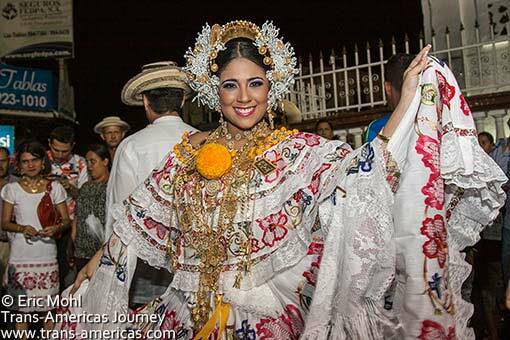 Daris Nicole Sánchez Brandao, the next Calle Abajo Carnival Queen in Las Tablas, rocks her pollera during processions on the last day of Carnival. 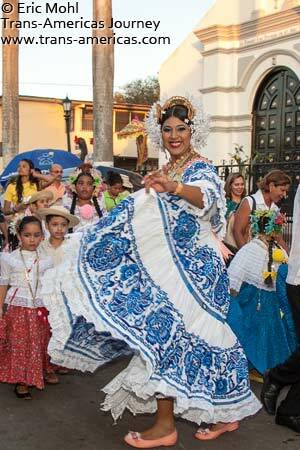 The pollera procession begins in La Villa de Los Santos, Panama on the final day of celebrations marking Carnival. 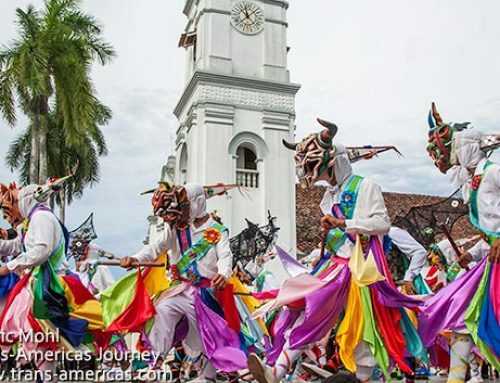 Polleras, the national dress of Panama, come adorned with different styles of hand embroidery work including single tones and this multi-colored, bird-themed design seen in Las Tablas, Panama during the final day of Carnival celebrations. 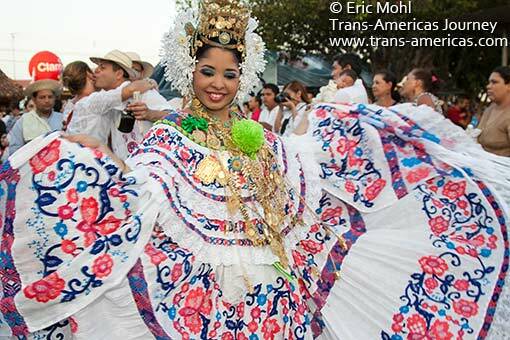 Everyone in their polleras during processions on the final day of Carnival celebrations in Las Tablas, Panama. 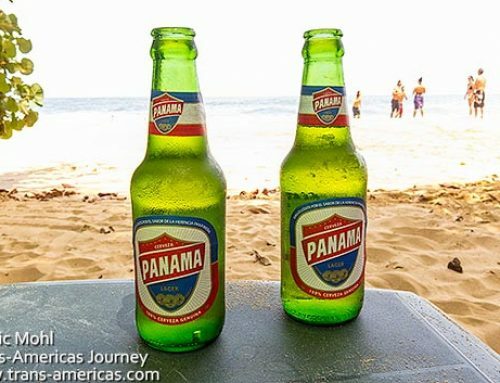 Polleras are actually a Spanish invention but they’ve been wholeheartedly embraced in Panama where the tradition is enjoying a healthy resurgence, despite the price tag. 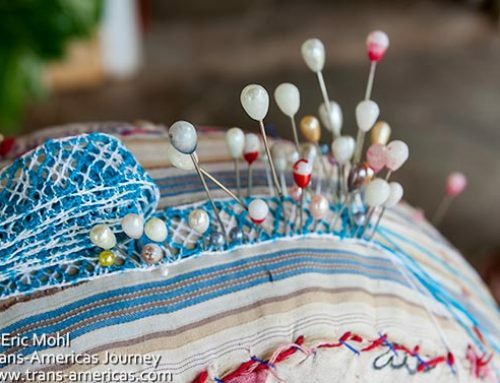 Polleras are undoubtedly beautiful and it’s easy to see the level of work that goes into each one but we were stunned to learn that the very best polleras can cost tens of thousands of dollars for the hand-stitched pleated skirt and underskirt and the embroidered yoked top. 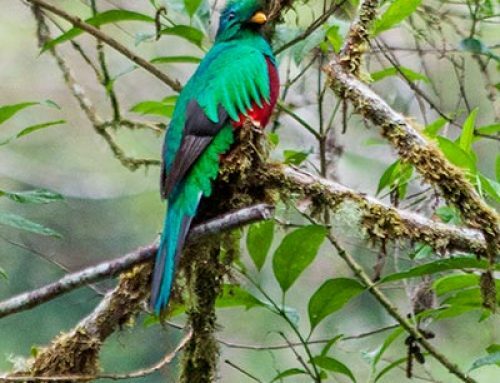 By the time you’re properly decked out you could be looking at a US$60,000 outfit. 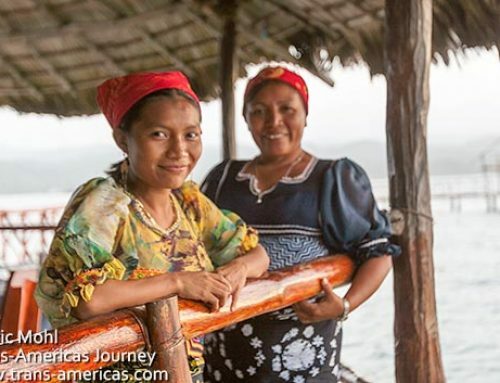 There are a handful of master pollera seamstresses still at work in Panama and a quality pollera can take six months or more to hand stitch. 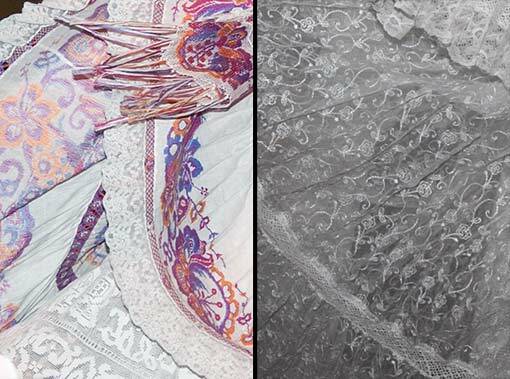 Two different styles of polleras: colorful hand stitching and intricate all-white thread work. Either way, it takes months to create a proper pollera and it’s all done by hand. Of course, no pollera is complete without the right accessories which, tradition dictates, must be in the form of elaborate, long, solid gold necklaces and ornate gold hair combs and head dresses called tembleques. Sometimes these headdresses are adorned with Swarovski crystals. Accessories are as important as the pollera dress and final touches include tembleques featuring beaded and sometimes Swarovski crystal studded hair pieces held in place with gold combs. 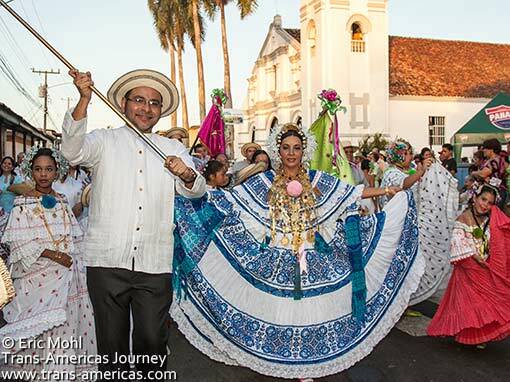 We could see the pride as women put on their polleras and joined the processions (this one in Las Tablas) that marked the final day of Carnival in Panama. There are a lot of rules too. For example, the shoes (blessedly, flat for once) must be the same color as the fluffy pom poms and ribbon on the dress. And, no, we have no idea what the pom pom signifies. 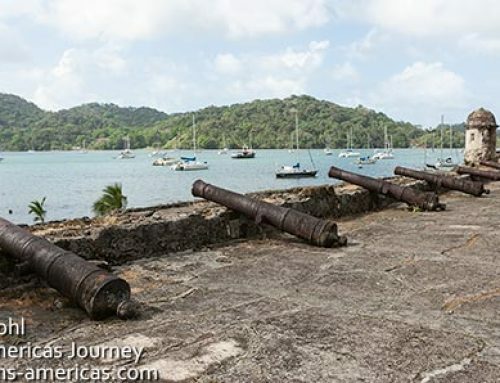 Please chime in if you do. Young women also wear a pollera style that’s different from the version worn by adult women. 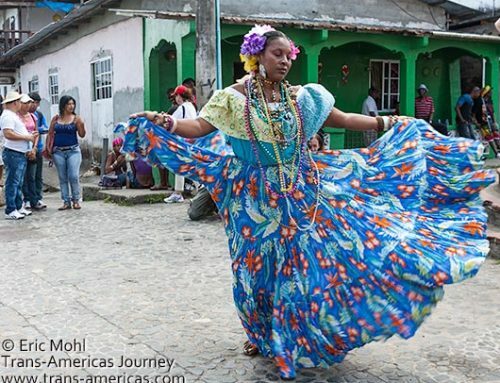 A girl in Santo Domingo sporting a bright pollera. We also saw toddlers walking around in mini-versions of Panama’s national dress during the final day of Carnival celebrations. Polleras played an important roll in the final day of Carnival in Panama. 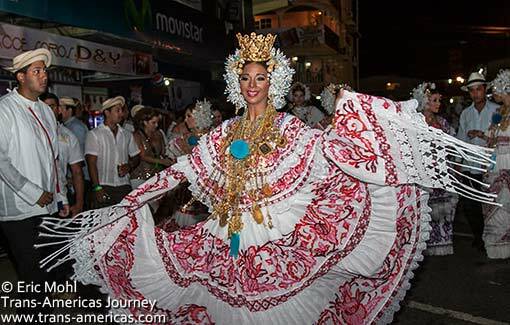 We got a backstage look at the pollera preparations in La Villa de Los Santos as Joanne Vásquez, the local Calle Abajo Carnival Queen, put the final touches on her stunning outfit before participating in the pollera parade around that town’s sleepy town square and past the proud church. 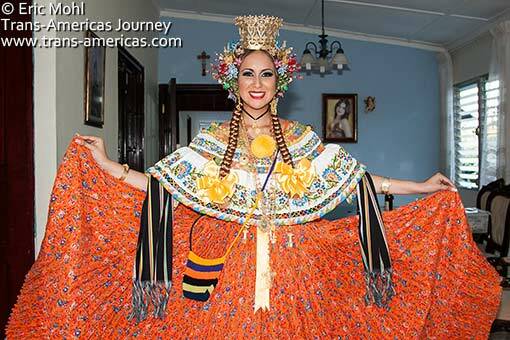 Joanne Vásquez, the Calle Abajo Carnival Queen in La Villa de Los Santos, Panama, prepares to leave her home and join the local pollera procession. We’d witnessed Joanne’s crowning three days earlier and the contrast between her flashy coronation dress (which involved a bra top, a skin-tight skirt slit up to there, and lots of red beading) and her elegant, heirloom pollera was stark. A proud pollera wearer in La Villa de Los Santos, Panama. 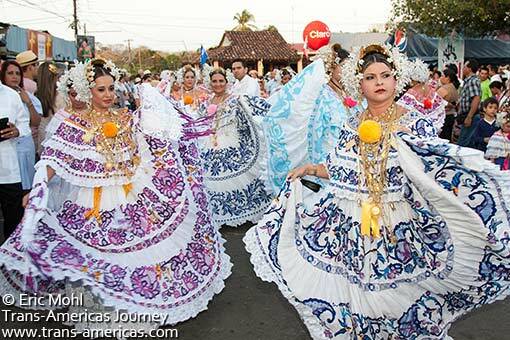 In the small farming community of Santo Domingo the Carnival queens lacked the polish (and checkbooks) of the Carnival queens in Las Tablas. However, the whole town got involved and poured plenty of pride into their procession which included kids barely old enough to walk all the way up to grandmas almost too old to get around. 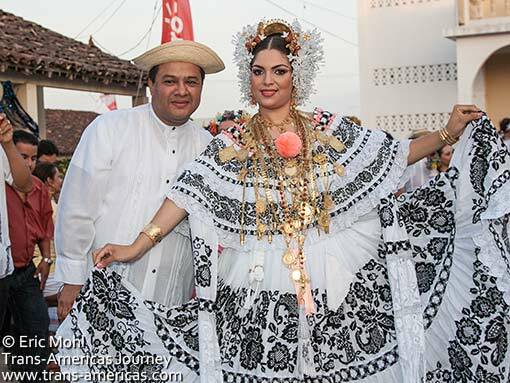 The perfect traditional Panamanian couple in Santo Domingo: she’s got her pollera on and he’s wearing the traditional collar-less shirt and tiny hat. 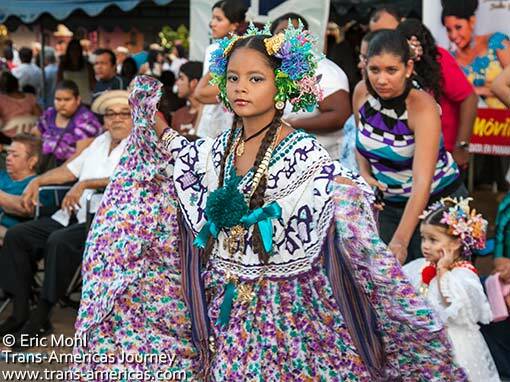 Colors swirl together during the pollera parade in the farming town of Santo Domingo, Panama. 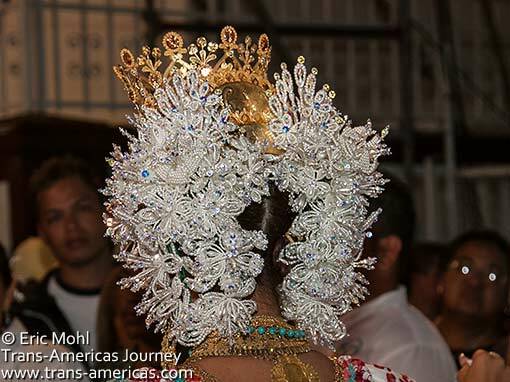 One of the Carnival Queens in Santo Domingo, Panama during that town’s pollera procession. Note the smoochy man behind her with the bottle of Grand Old Parr whiskey in his hand. 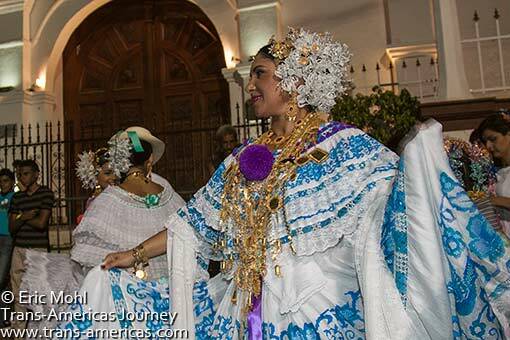 What Santo Domingo lacked in big-city flash it made up for in quiet authenticity as the town turned out in traditional finery to celebrate the final day of Carnival as you can see in our video, below. 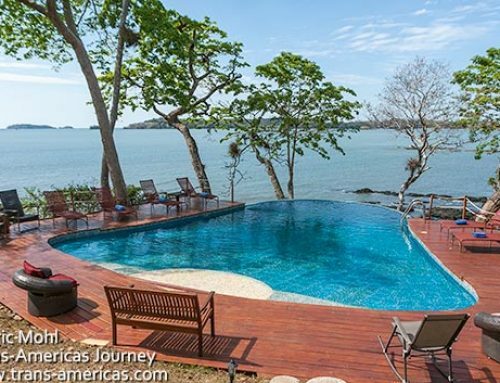 Not surprisingly, the pollera parade in Las Tablas was the largest and richest in the region. 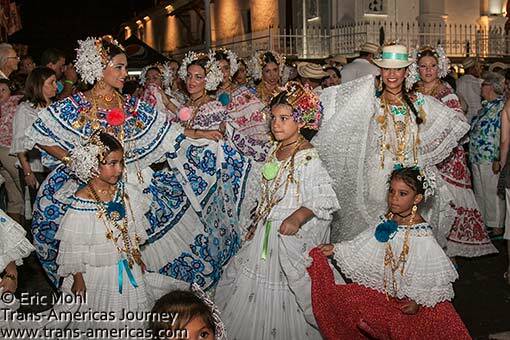 Hundreds of local girls and women turned out in their finery and they were ultimately joined by Ana Gabriela Rodríguez Vasquez the Calle Abajo Carnival Queen and Maruquel Madelaine Gonzalez Valesquez, the Calle Arriba Carnival Queen. This was a great opportunity to see the different styles and colors of polleras side by side, like a pollera fashion show. The Calle Arriba Queen had so much gold hanging around her neck we thought she’d topple over. No wonder she had a sort of human force field around her. She was like a walking Fort Knox. Maruquel Madelaine Gonzalez Valesquez, the Calle Arriba Carnival Queen, during the pollera procession on the final day of celebrations in Las Tablas, Panama. We believe she wore at least three different polleras and there must have been ten pounds of gold around her neck. 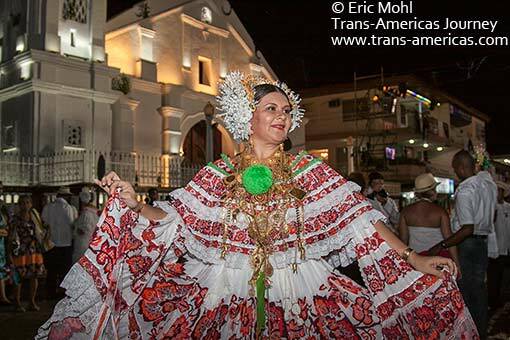 Ana Gabriela Rodríguez Vasquez, the Calle Abajo Carnival Queen, during the pollera procession on the final night of celebrations in Las Tablas, Panama. We think her crown was much more impressive than her rival’s. Will the Calle Arriba Carnival Queen collapse under the weight of all the gold she’s wearing? 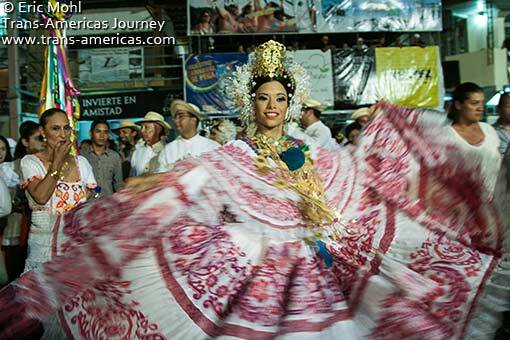 See for yourself in our video, below, from the pollera procession in Las Tablas, Panama on the final night of Carnival. 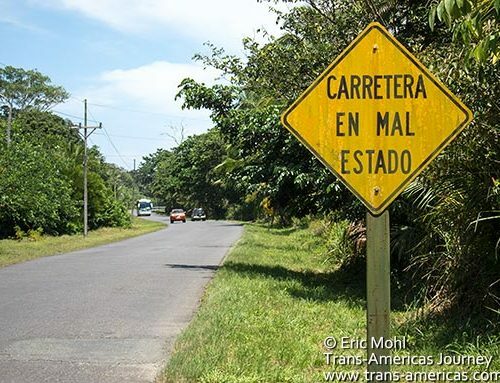 To really get your fill of polleras plan to be in Las Tablas, Panama for the Parade of 1,000 Polleras. 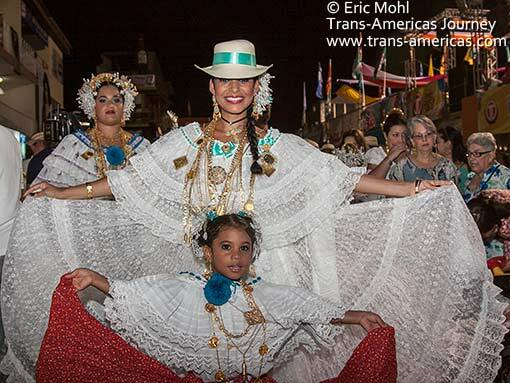 This annual event, usual held in January, includes nearly every woman in the region wearing her pollera finery usually attracting more than 1,000 paraders. 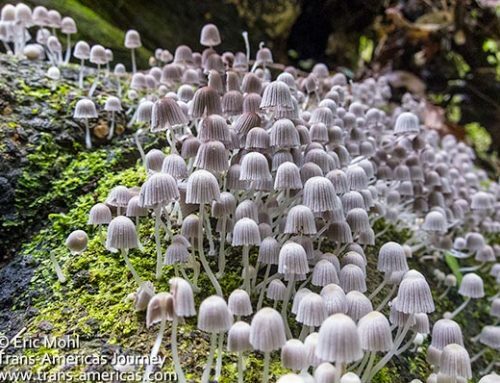 Polleras come in many sizes and styles. 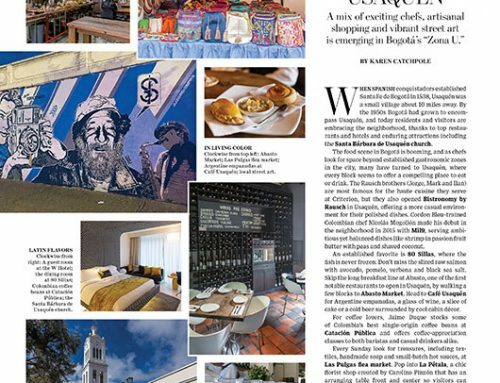 In Santo Domingo, check out Hostal Familiar La Casita de los Kimmell. 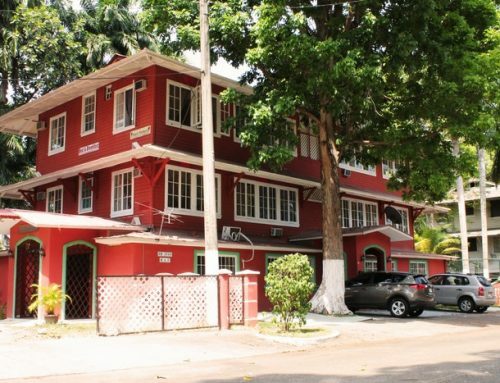 Martha Kimmell has stylishly transformed her great grandmother’s home into a peaceful, well-appointed (A/C, Wi-Fi) and very comfortable five room guest house (from US$92.60 during Carnival but cheaper the rest of the year, including breakfast and a welcome cocktail). 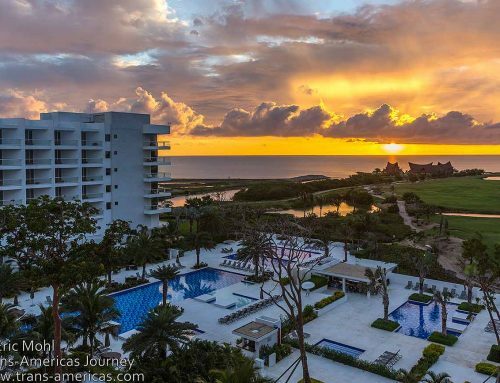 It’s located just a few blocks from the square in Santo Domingo and the cool, quite rooms and peaceful garden with hammocks are the perfect places to rest up for more Carnival action. 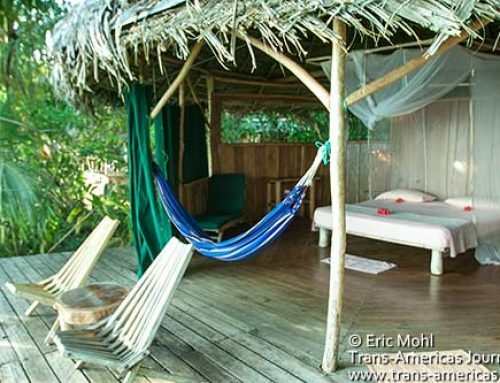 Reservations are a must during Carnival.